Cable remains under daily cloud top (currently at 1.3108) following mild reaction on UK jobs data. Unemployment remains unchanged in Feb (3.9%), employment in three months to Feb came slightly above expectations (179K vs 173K f/c) but stronger than expected jobless claims (Mar 28.3K vs 20K f/c) offset positive impact. The most significant average earnings remained unchanged and in line with forecast (3.5%). The pair remains within multi-day congestion that stays capped by daily cloud top, with scenario supported by flat daily indicators and absence of Brexit news in holiday-shortened and lower-volumes week, maintaining sideways mode. Daily cloud top / Fibo 38.2% of 1.3381/1.2977 (1.3108/16) mark pivotal barriers, break of which is needed to generate initial bullish signal. 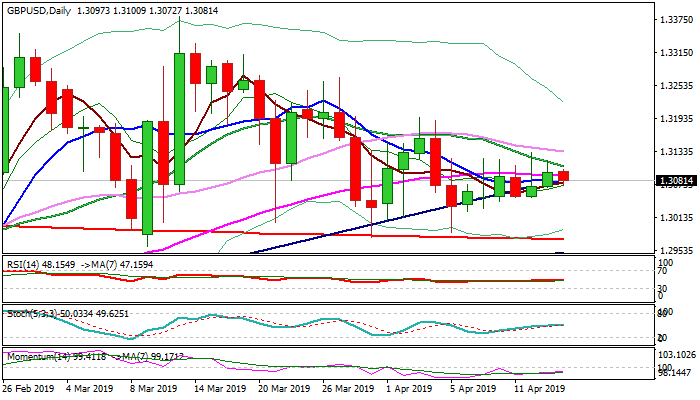 Conversely, dip below near-term congestion floor at 1.3040 zone would generate initial negative signal and expose key support at 1.2972 (200SMA).